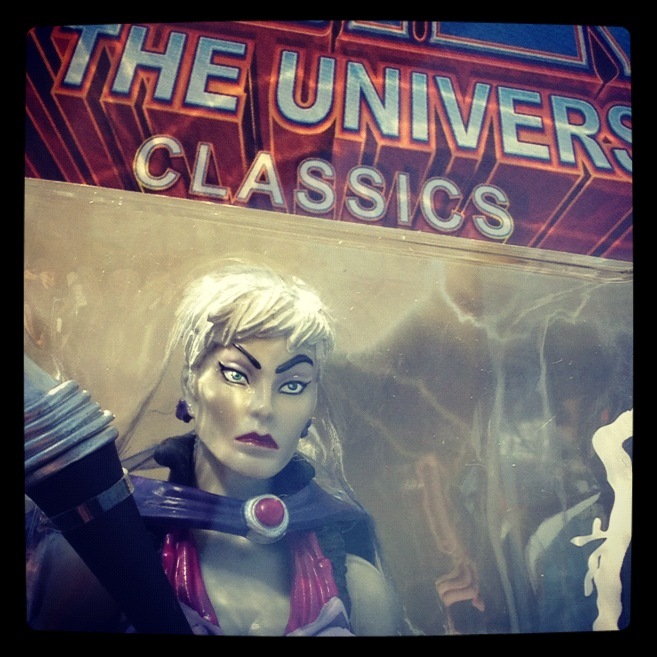 This month’s Masters of the Universe Classics quarterly variant slot is the great 200x, modern, Battleground Evil-Lyn! I was definitely looking forward to this release because the 200x version of Evil-Lyn was one of my favorite MOTU character designs. Unfortunately, as the name says … it is not 200x Evil-Lyn, it’s Battleground Evil-Lyn. She joins Teela as our second Battleground variant in the line. I was getting a little bit irritable with Matty (more specifically Newgistics) when, according to their tracking, my order had been sitting in Fisher, IN for the last week. Well lucky for me it showed up at my door today. I was getting worried that my Demo-Man was going to end up shipping before Evil-Lyn and Wind Raider showed up. As I had said before, this release really excited me because I was hoping it was going to be my 200x version of Evil-Lyn. It wasn’t. But it is a really well done figure regardless. I really like the white skin tones and the redeco of her dress. She also comes with a cape, and the stave she previously came with in a new color. The stave also has a switchable stone on top, it can be purple or white depending on your mood. Finally the biggest addition is the new head, a head without a helmet showing her white, pixie hair cut. Because she is mostly reuse of the original Evil-Lyn/Teela body she doesn’t have the features that the She-Ra 2.0 body has so she is limited in some respects such as riding steeds. She also had her left hand replaced with a “casting” hand instead of the normal gripping hand. The original Teela body is still pretty good in my opinion. It has a good base and she is easy to balance and pose. Paint is a little bit sloppy on the figure. There are a lot of different applications on the dress and some parts were sloppy or just missed. At a distance it is not too noticeable, but if you get in close you can see they got a little sloppy on this one … especially after that beautifully hand painted prototype they showed prior to sale. Paint on the face though is very strong and solidly done giving her a great stern look on her face. Overall this is a very solid addition to the quarterly variants pool. Sure it’s not the 200x Evil-Lyn, but its a nice in between with an awesome new head. I was really looking forward to this one since its announcement and having it in hand did not disappoint. The only disappointment with this figure was the shipping … but its not likely that problem will be solved any time soon.